Nyah nyah ni nyah nyah I got to watch Inside Out before yoooooou doooooo. Phhhhhbbbbtttt! Nyah nyah! Ha Ha! Inside Out is, as the box says, a major emotion picture. It is not a Fantastic Voyage style movie about how the brain works, but is more of a shallow Journey to the Centre of the Mind. 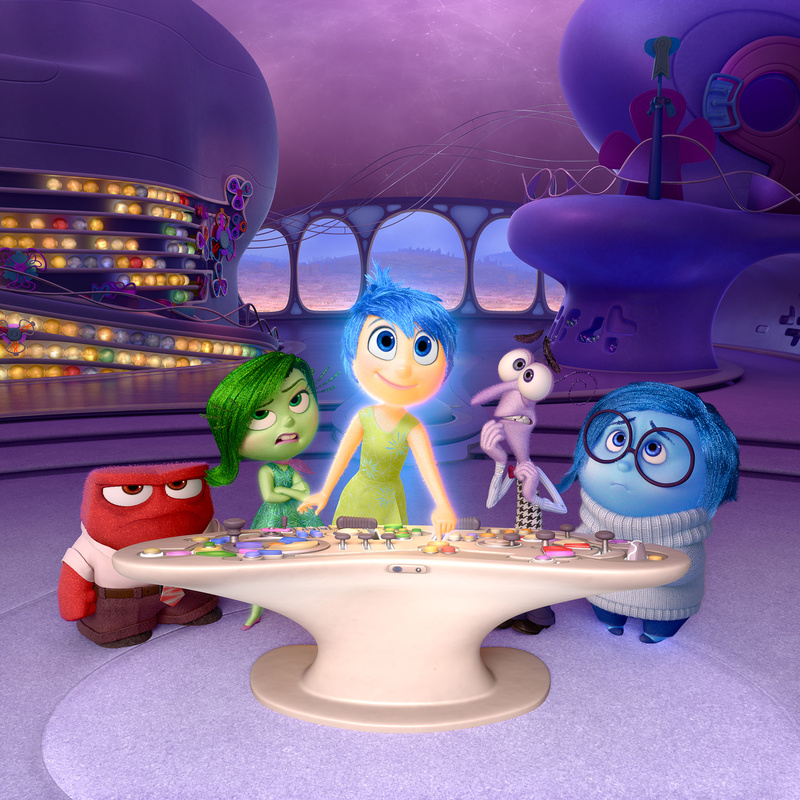 Inside Out follows the emotions of Riley, an 11 year old girl. More specifically, it follows the representations of her emotions, in the form of Joy, Sadness, Fear, Anger and Disgust as they work together and sometimes cross purposes to control her actions and help her through her day to day life. However, Riley’s emotions become dangerously unbalanced when both Joy and Sadness get lost somewhere in long-term memory, leaving her with only Fear, Anger and Disgust, who have to figure out how to get her through a recent family move to San Francisco. Inside Out is primarily about our relationship with our emotions. A lot of thought has gone into the making of this movie. In order to give the most accurate depiction of the mind, Pixar consulted with both Dr Paul Ekman, a pioneer in the study of emotions, and Dr Dacher Keltner, Professor of Psychology at the University of California, Berkeley. The subject matter of the movie is very heavy and is treated with great respect. Every part of this movie – the music, the staging, the lighting and even the voice acting – is designed to evoke an emotional reaction from the audience. From the very first scene in the movie, the viewer is encouraged to empathise with the characters, experiencing the feeling of joy from a baby looking at its parents for the very first time, or the despair from a child missing home. The voice acting is pretty good, by the way, with a large number of Saturday Night Live veterans lending their voices to the different emotions. Amy Poehler and Phyllis Smith do especially good jobs bringing emotional life to main characters Joy and Sadness and I was particularly pleased with the casting for Anger, who is played by professional Daily Show angry man, Lewis Black. MUMMY WARNING: This is not a movie for little ones, not because it has anything violent or sexual in it, but simply because the subject matter is so dense that it literally cannot be comprehended by anyone under the age of 7. I may not have kids, but I did notice that after the movie ended, there were a lot of excitably chattering tween aged kids (8-12), a lot of quiet and thoughtful teenagers and adults (13 and up) and a LOT of completely inconsolable little children (7 and under). What happens in this movie STAYS HAPPENED. It does not magically get better. It STAYS HAPPENED. This is a movie for tweens. Like many other works by Pixar, this is a movie that needs to be watched and then seriously talked about afterwards. It is a movie about growing up and getting in touch with ones emotions, but it is also a movie about the bad things that can happen if you don’t. Given the mature way that the subject matter is handled, I think that it is a movie that HAS to be watched. And, it is beautiful and good, a bit like watching the beginning of Up – poignant and sad but hopeful. I hope to see more of this sort of work from Pixar. Inside Out is already in theatres in Australia (Nyah! ), but it will be showing in Singapore from 27th August 2015. Australia very rarely if not almost never gets movies before Singapore does, so when we do, I think it’s only fair that I get to lord it over everyone else every once in a while. Joseph: King of Dreams certainly is a movie. It sure is animated. I could definitely see all the drawings and hear all the voice acting. Also, it had music and songs in it. I am writing this review to remind myself that I have watched this movie, because it was so unremarkable that I’d actually forgotten that I’d already watched it last year. The problem with this movie is that it is not Joseph and the Amazing Technicolor Dreamcoat by Andrew Lloyd Webber, which is so bad that it actually swings right around to good again and continues on to become absolutely fabulous. This movie is not that. It is not bad, but it is not good. It just is a movie. You should watch Joseph and the Amazing Technicolor Dreamcoat instead. I hear that Elton John is going to make it into an animated movie soon. P.S. Find Joseph: King of Dreams here . What? I said it was a fabulous show. Today, J was very busy with Other Things, so I had the opportunity to spend some time with Little E! Now that Thumper has arrived, she has been such a great big sister to him, but I still want to show her that having a small baby around does not mean that she will not be receiving any attention from me. This is why I planned a little excursion just for her! We started out by having a Very Leisurely Breakfast at the Ya Kun Kaya Toast branch down at Holland Village. I ordered a set of steamed bread with kaya which came with a nice cup of tea (for me) as well as soft boiled eggs in a dish. 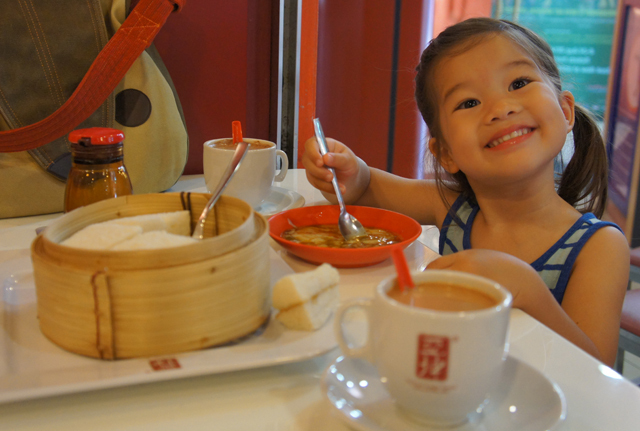 Little E had a cup of Milo to herself and happily ate the runny eggs with a spoon, occasionally taking a mouthful of fluffy steamed bread. Tasty soft boiled eggs with soya sauce, steamed bread and hot drinks! Afterwards, we drove down to the SPCA (Society for the Prevention of Cruelty to Animals). The Barn Owl and I want to teach the children to respect nature and be kind to animals, and we have always said that if we ever decide to welcome a dog or a cat into our family, we would probably adopt one from a rescue shelter. 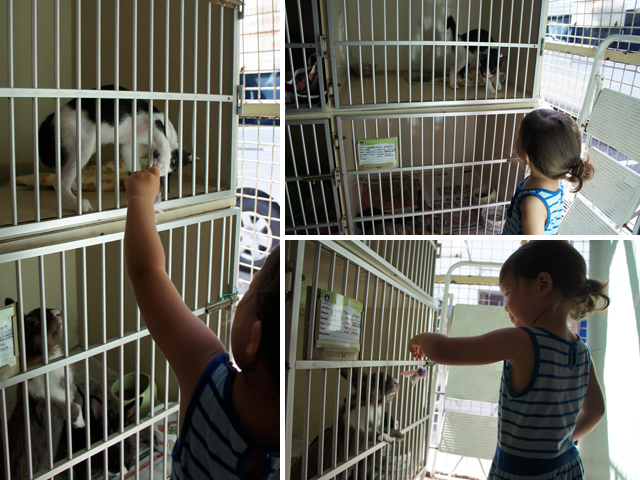 This was Little E’s first visit to the SPCA animal shelter so along the way, I talked to her about why animal shelters exist and the responsibility that pet owners have towards their pets. She was very impressed by the idea that people would buy pets on impulse only to abandon them later on, and she was shocked that there were people who would actively abuse animals. It was pretty busy down at the SPCA, much busier than I expected. 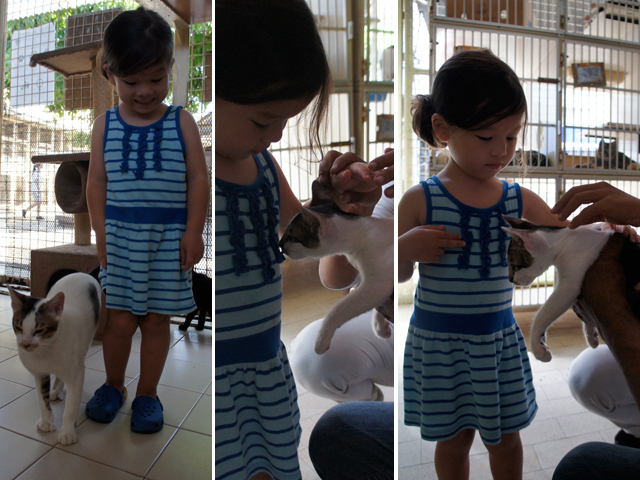 There were volunteers taking the dogs for walks or bathing them, and others in the cattery grooming the cats. The dogs got a little overexcited when we approached and started up a real hullabaloo which put Little E off visiting with them, so she decided to stay within the cattery, which was much more quiet. There were some helpful volunteers who encouraged Little E to handle the animals gently and took the time to talk to her about the challenges of rehoming and rehabilitating animals who have been abused or neglected. 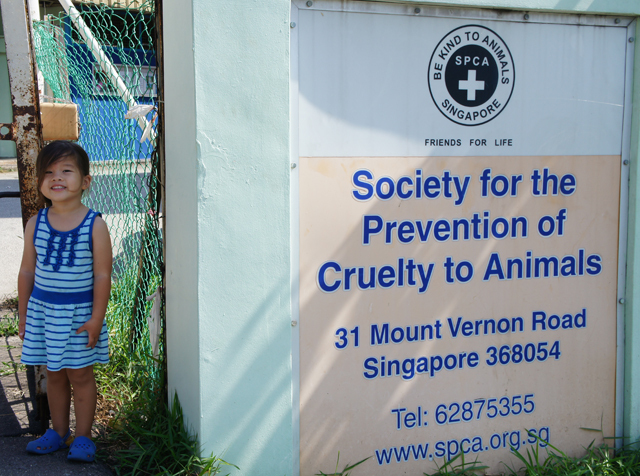 We found out that the SPCA is moving from their current premises at Mt Vernon, to a much larger facility located in Sungei Tengah. The new animal shelter will have much more room to house more animals, and will include a rehabilitation centre as well as an exercise and agility course. 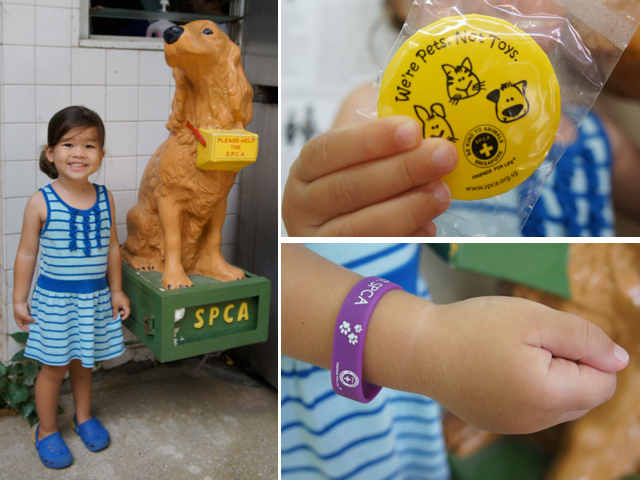 When Little E heard about this, she said that she wanted to help build more homes for stray animals – so I took her to the SPCA shop and she bought a little bracelet for herself and a yellow button for J. She also dropped some of her angpow money into the donations box! Yay, Little E! If you would like to make a donation towards the new animal shelter, you can do so here. Although Singapore has tried to cultivate a local arts and entertainment scene, it’s never been (to my mind at least) a particularly big one. We’re not exactly noted for our great thespians. Plus, despite being the country that apparently takes fun seriously, we’re not exactly famous for our hilarious comedians either. In the eyes of the world, Singaporeans are generally unfunny people. That being said, I’ve heard a lot of good things about the Dream Academy‘s Dim Sum Dollies, so on my last visit to Singapore, I purchased a pair of tickets to the opening night of the their rendition of The History of Singapore – Part 1 on the basis that it promised to be a very funny show and also because I saw pamphlets for it everywhere. Plus, I wanted to have some bonding time with the Aged P.
The show wasn’t just funny. It was FABULOUS. I mean, just look at it! Not only was the staging good, but the music was also fantastic. The Dim Sum Dollies have good voices and aren’t afraid to show them off. The choreography was fairly impressive as well, masterfully executed by a line of chorus dancers collectively known as the Lo Mai Guys. 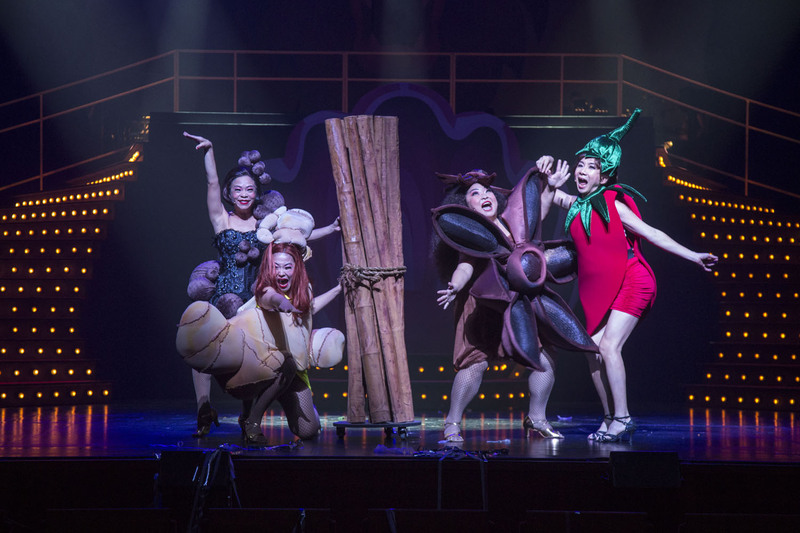 The show was pretty successfully stolen by Hossan Leong, who played a variety of roles and filled in the gaps between scenes with a few hilarious comedic vignettes. I really had a great time. The girls had both the Aged P and I laughing hard at their punny jokes and tongue-in-cheek humour. A lot of the jokes required knowledge of dialects that I do not speak, but the delivery was funny enough for me to get the point. I particularly enjoyed the Spice Girls parody song about the five spices traded through the port of Singapore. That being said, the musical does suffer a little from a lack of cohesion and there were one or two painfully unfunny segments, I felt, could have used a bit more of an editor’s eye. Still, those segments had most of the theatre in stitches, so perhaps it’s just a matter of taste. 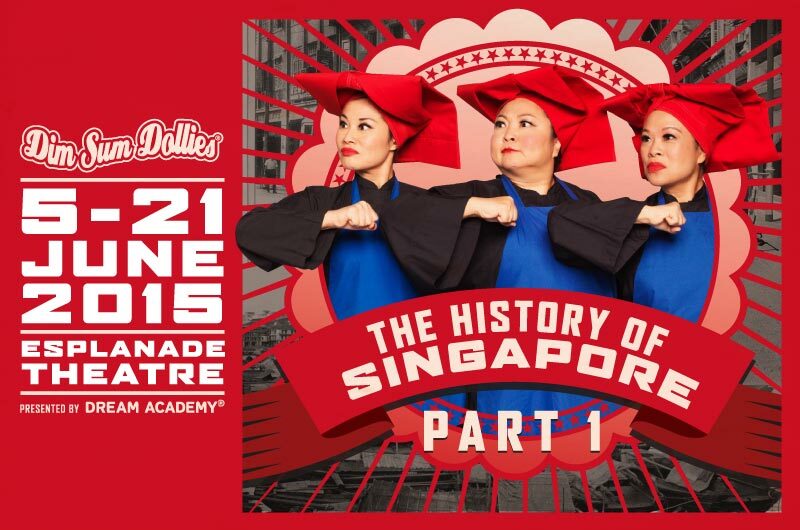 If you’re looking for an evening’s diversion, I don’t think you could go wrong with The History of Singapore Part 1, and I do hope that the Dim Sum Dollies have greater and more hilarious surprises for us in the future. 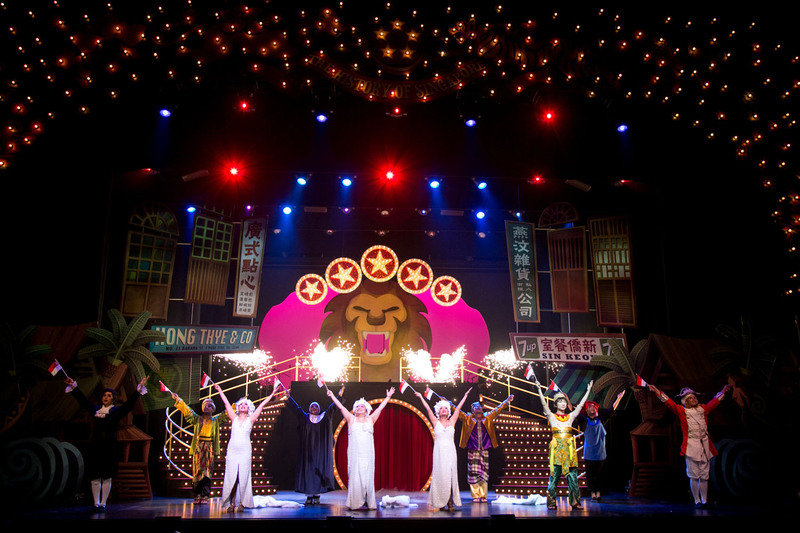 The History of Singapore Part 1 will continue its run at the Esplanade Theatre until the 21st of June. Tickets can be booked with SISTIC and start from $68. No, we are never going to live that phrase down, so let’s just embrace it for what it is. 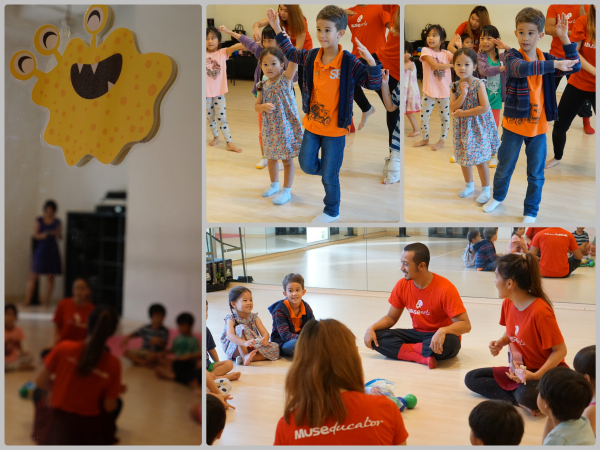 A fortnight ago, J and Little E were invited to attend a holiday camp called ‘My Amazing Body’ run by Muse Arts Singapore at Natasha Studio in City Square Mall. When Jacintha (the director of Muse Arts Singapore) contacted me to invite us to join the camp, I was a little bit skeptical about what it was all about. The camp would be 2 hours long, during which the kids would take part in an adventure story about the human body through music, dancing, drama and arts-and-craft. What an impressive range of activities crammed into a short space of time! I thought to myself. How is this possible? I asked the kids if they would be interested in attending a holiday camp where they would learn about the human body and they seemed pretty keen, so I signed them up. I figured that it would give me 2 hours to wander around City Square Mall, maybe even take advantage of the Great Singapore Sale! Heehee! The camp focussed mainly on the importance of maintaining good personal hygiene through the use of soap, proper hand washing and dental care (Little E and J are already very familiar with this as they are raised by two medical doctors). During the camp, the children were taught a little song and dance, which they repeated several times after each activity and performed for the mums at the end. Although the camp is aimed at children from 4-7 years old, I felt that the activities were more appropriate for a younger age group, perhaps just preschoolers. J, being 7 years old and already in Primary 1, definitely did not take away anything new from the camp, but he did enjoy clowning around with the instructors and grooving along to the music with the other kids. Little E, however, became a little bit tired of the repetitive nature of the dancing and decided to rest at the side of the room, just watching the other kids who seemed very engaged, laughing and prancing about. She revived a little by the end of the camp, just long enough to take part in the end of class showcase! As for myself, I thoughtfully spent my two hours sitting in a plush sofa, observing the camp whilst discreetly breastfeeding Thumper, checking out the shops in City Square Mall (specifically Uniqlo, Daiso and a surprisingly well-stocked, reasonably priced bookshop in the basement called ‘My Greatest Child’), before settling down for a foot reflexology massage. My foot being kneaded into putty by a nice young man. I’ve never had a foot reflexology massage before, but it is both excruciatingly painful and incredibly relaxing at the same time. You can’t see it from the picture, but I was so relaxed that I was falling asleep. I nearly dropped my camera on Thumper’s head (he was asleep on my chest in his little baby sling). At the end, my feet were pink and happy, and everything was just roses and sunshine. So, if you are feeling like you desperately need a break away from your preschooler for some grown-up me-time (or so that you can browse Daiso without having to say to the phrase “please stop touching EVERYTHING”), then the Muse Arts camp is a good way to keep the kids gainfully occupied for a few hours. If you’re interested, here’s a copy of the flyer for the next holiday camp which is on the 22nd of June! 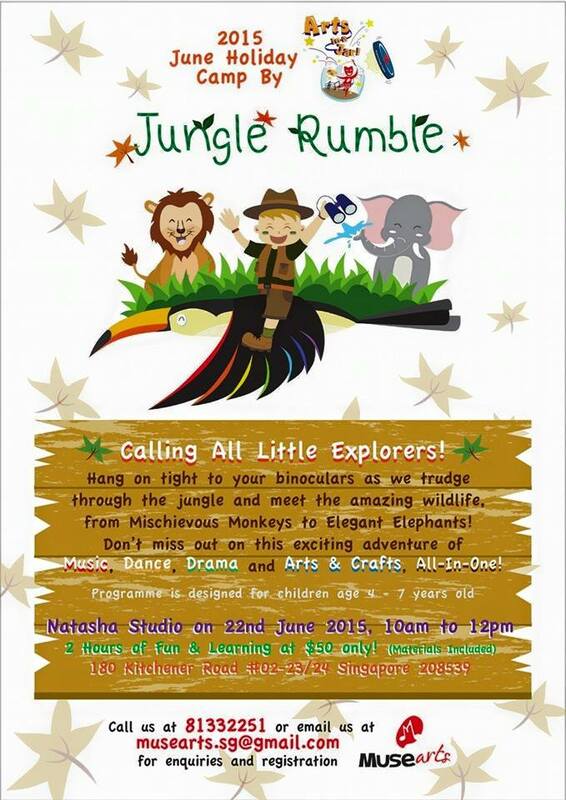 Muse Arts has also agreed to give 10% off registration fees for Owls Well readers who quote “owlswell” when registering their child/children for Jungle Rumble by this coming Friday, 19th June 2015. Over here in the owls’ nest, the kids spend more time playing in the living room than in their bedroom. To be honest, I prefer them in the living room where I can keep an eye on them when I’m fussing about the house. In one corner of our living room is the music corner, which is where J and Little E will practice their violin each afternoon. It is also where our sound system sits in state, surrounded by great drifts of CD boxes as well as a mountain of violin cases and music books. Our house is never without music! The kids have amassed a ton of toys due to the generosity of friends and relatives but having all their toys out at the same time can be overwhelming (and messy). This is why I keep the children’s toys on rotation. Every so often, I will put one of the plastic toy tubs back into their room and bring out another tub filled with different toys. Sometimes it will be wooden building blocks, or a box of cars, or large floor puzzles. This week, it’s a new set of Meccano from the visiting Outlaws. The only toys that are a permanent fixture in one corner of the living room are the LEGO, which are J and Little E’s ‘go-to’ toys. J and Little E’s LEGO collection has been quietly expanding over the last few years, so keeping them organised is a real challenge for me. 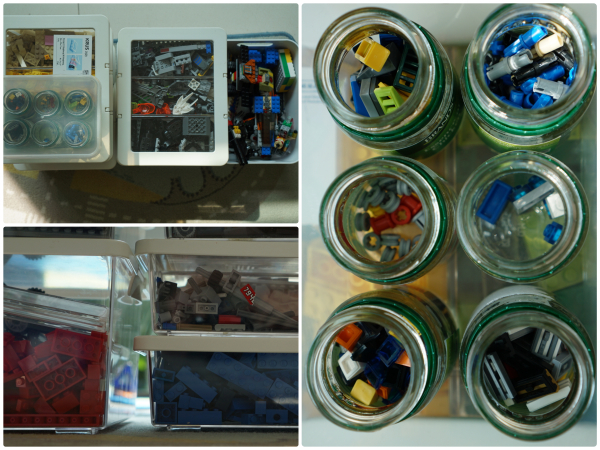 Right now, I am using a combination of compartmentalised, stackable boxes from IKEA, takeaway containers and old chicken essence bottles1 to sort and store their Legos pieces. The bricks are organised by colour and type, with the tiniest pieces sorted into small glass bottles that fit nicely into a plastic takeaway container. Everything is in clear containers so that J and Little E can find the bricks that they are looking for without having to dump everything out on the floor. There is nothing more painful than stepping on a stray segment of Lego – and then having to placate the child whose half-finished project you have inadvertently dismantled. I always insist that completed or half-finished Lego projects are tidied into baskets at the end of playtime, which keeps them out of the way. The kids love playing on their carpet, which is great for marking out the boundaries of their play. This way, the toys that the kids play with tend to stay on and around the mat, and don’t spread about the house. Similarly, the kids also tend to stay on and around the playmat and don’t spread about the house. This is a neat trick that I learned from the Aged Ps, which came in especially handy when the kids were very tiny tots. I could leave 2 year old J on the mat, go have a nice long shower, and come back to find him still pushing his cars around, saying ‘Vrrrrm’ thoughtfully to himself. Now that Thumper has come along, he will sit quietly in a swing in a corner of the playmat or lay on his tummy on a quilt on the living room floor, observing his siblings. J and Little E will talk to him whilst they play, occasionally breaking off from their games to make faces at him or give him a cuddle. 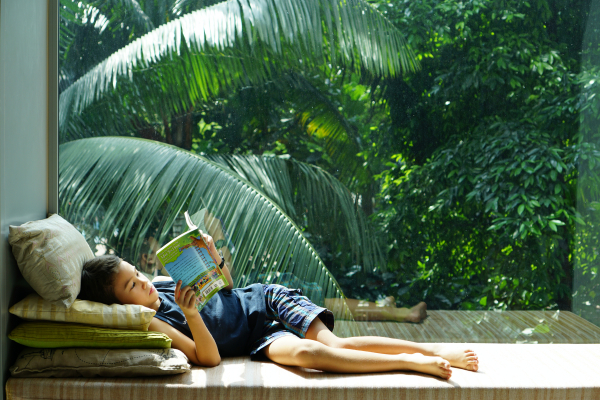 My favourite place in the living room is definitely the window seat, which the kids use as a reading nook (or day bed). The windows of the living room look over some lush greenery, and you can often see birds and butterflies flitting through the trees. There’s plenty of natural light filtering in through our giant windows, so I don’t have to worry about their eyes. Occasionally, the J or Little E will draw the day curtains in front of the window seat, and it becomes a little hideout for them! Up next on the blog train is Jus over at Mum in the Making. 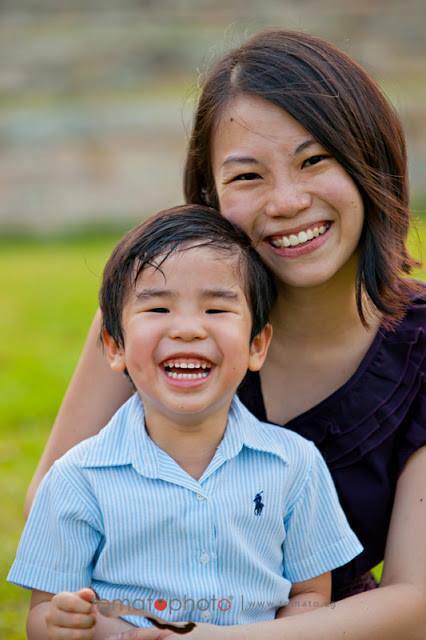 Jus is a stay-home mama to three little boys, and spends her days homeschooling, reading and doing crafts with her kids. 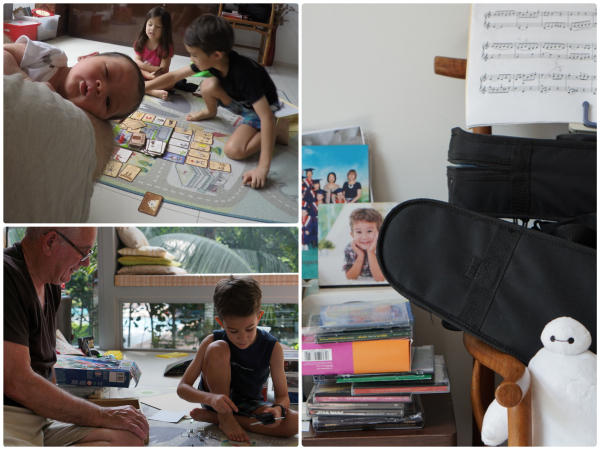 She will be sharing the learning area that has been carved out for her boys from their home’s entryway, so do pop by on Monday to read about it! I’m really looking forward to Small Spaces on Mum in the Making – she has such a flair for interior design! This post is part of the Small Spaces blog train (hosted by Mum in the Making!). Click on the button below to see more Small Spaces and find out how other families tailor their homes to accommodate their children! 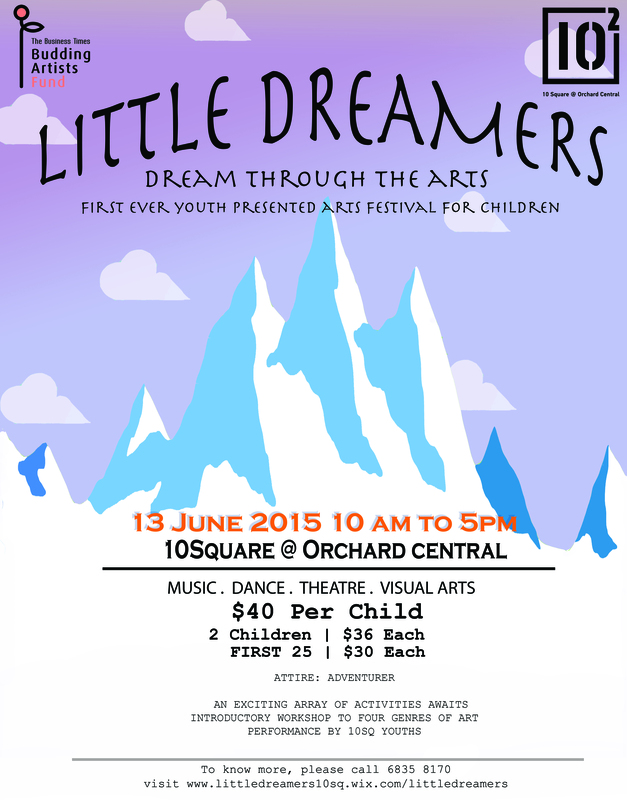 Owls Well is proud to support the upcoming Childrens’ Art Festival, “Little Dreamers”, organised by the Youth Division at 10 Square @ Orchard Central (under the RICE company)! This is a full day of workshops for kids in introductory theatre, music, dance and visual art, concluding with an exciting youth performance titled “Wish Upon a Star”. We’ve invited to attend, but weren’t able to because of prior commitments (i.e. the Outlaws being in town), but it sounded like so much fun, I really wanted to share with the Owls Well readers – especially those who are still scrambling to look for ways to occupy the kids this weekend! Additionally, the organisers behind the festival agreed to give Owls Well readers a special discount! How cool is that?! Owls Well readers are entitled to 25% discount off the ticket prices with the code OWLWELL25. (Please provide the code when paying for the tickets or making enquiries). Tickets can be purchased via Peatix or through walk-ins at 10Square@Orchard Central. Enquiries can be made at aqram@therice.sg or shaun_ng@therice.sg.